Riker serves as an exchange officer on a Klingon warship. 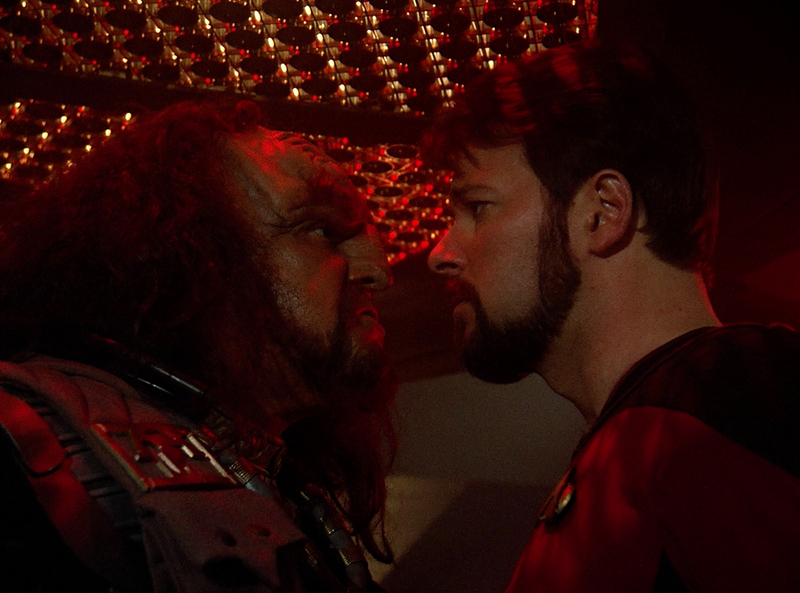 It’s our first indepth look at the Klingons in TNG. Rob is thoroughly unimpressed by this episode, but Grant likes it – along with most other reviewers. First Broadcast: 6th Feb 1989. Posted in Season 2, TNGTagged Benzite, Bird of Prey, Exchange, Klingons, Riker, WorfBookmark the permalink. A funny thing I noticed: how are Klingons able to circumvent the federations universal translator at will? Like at the beginning when Riker beams over. This concept is rehashed in the PC game tar Trek: Bridge Commander. I thought they could do an entire spinoff series myself. Would have been interesting. Watching this episode, I thought Captain Kargan (Chris Latta) looked familiar… he shows up (at least one more time) in the Samaritan Snare as Captain Grebnedlog.